Well, it’s that time of the year! The tomato questions are pouring in on our discussion board, Andre’s radio show, and over the phone and e-mails. At this point, the questions are mostly concerning problems with the foliage and just a few about the fruit. There are several things that can cause tomato leaves to curl but this combination of symptoms seemed consistent with herbicide injury. 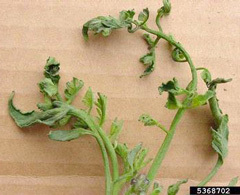 Herbicide drift can be a major problem for tomatoes because they are very sensitive to broadleaf herbicides. Even light exposures can result in injury to the plants. If an herbicide like glyphosate (Roundup) or a product containing 2,4-D or dicamba is applied in the vicinity of a vegetable garden, it can easily drift onto the plants. Herbicides can drift quite far when caught by the wind! If they are exposed to only small amounts, the plants will usually survive and eventually outgrow the damage. Heavier exposures can be lethal. 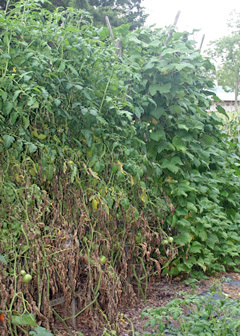 Drift is not the only way that tomatoes can be exposed to herbicides. If you spray your tomatoes with a fungicide or insecticide using a sprayer that has also been used to spray an herbicide, there may be herbicide residue left in the tank. Herbicide damage can also occur if tomatoes are mulched with grass clippings from a lawn that has been treated with a weed and feed product or a broad leaf weed killer. Lately, there have even been problems with plant damage resulting from mulches and compost that have been made from hay or manure taken from fields that had been sprayed with the herbicide Grazon. In this case, as I learned from a later post, it turns out that a neighbor had been spraying herbicides in his yard and the drift had hit the tomato patch. Hopefully over time the plants will recover but flowering and fruit production may be delayed. What else can cause tomato leaves to curl? Curled or rolled leaves can also be a physiological response by the plant to adverse weather conditions; too hot, too dry, too wet, too windy. 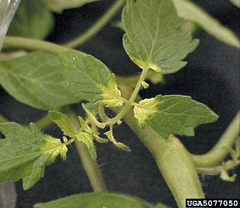 The overall growth of the plant is usually not affected and the symptoms normally disappear when conditions improve. Be careful not to over-water tomatoes. Overly wet soil conditions are often to blame for leaf roll. Mulching your tomatoes will help maintain more even moisture content in the soil and also helps to maintain a more constant soil temperature. There are several viral diseases such as curly top, yellow leaf curl, and mosaic virus that can cause curling of leaves, as well as stunted growth and pale leaves. There is no cure for these diseases and the plants cannot be saved. majority of the tomato problems we face. Some of the most common tomato problems are caused by fungal diseases. 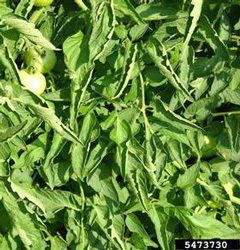 The tomato blights (early blight and late blight), as well as some of the wilt diseases and leaf spot diseases can be devastating to tomato crops. The first symptom is normally the yellowing of the older, lower leaves and branches. Fungal spores that cause these diseases are found in the soil and on plant debris left in the garden. It is very important to rake up and remove old plants, fallen leaves, and rotting fruit from the garden at the end of the season. This important “housekeeping” task will help to reduce the incidence of fungal disease in the following season. Mulching around your vegetable plants is another great way to reduce disease. This keeps soil (which may be filled with fungal spores) from splashing up onto the stems and leaves of your vegetable plants. Mulching the vegetable garden has so many benefits that it is worth doing every year! If your tomatoes are showing signs of disease, prune off the diseased branches and throw them in the trash (do not compost them). To prevent the disease from spreading to healthy foliage, spray the plants with a fungicide that is listed for use on edibles (Bonide Copper Fungicide, Mancozeb, or Fung-onil). Sometimes it’s good to alternate different fungicides. Always read and follow the label directions! Here are a few more tips to help you avoid (or deal with) tomato problems this season. Here’s to a great harvest!